Thanks to modern day technology, the resources available to our children, to help them overcome some of life’s greatest obstacles, seem endless. And with each passing day, pediatric therapists from all specialties are coming up with new options and ideas to provide their patients with the opportunity for optimal functioning in all aspects of their lives. But, sometimes, even with great strides in these children’s skills and endurance, the overall effect of attending therapy sessions can be tough on them mentally and emotionally. So how can you, as parents, give you child a more positive outlook when it’s time to go to their session? As caregivers, we make up a collective team that surrounds your child and pushes them to be successful by improving their skills. Doctors, therapists, nurses, even teachers aside, parents are the greatest support a child can have. So while children are sometimes sent home with “homework” from their therapy sessions, parents can do their own assignments as well. If you child is seeking more than one type of therapy, be sure to know the differences between the two. This way you can focus on improvements in each area of their therapy focus. Therapy can be difficult for your child in many ways, but the obstacles they will overcome will make you beam with pride. After a therapy session, your child may feel tired or somewhat down. There will be times when they work on a skill and are not able to accomplish it by the time they leave the office. This might leave them feeling defeated. But, when they work each week to improve and finally are able to accomplish that specific task, the feeling of accomplishment they will feel will give them a great sense of pride. As their caregivers, you will feel that pride as well. Let it show! When your child sees how happy it makes you when they work hard, it will push them to jump each hurdle with confidence. 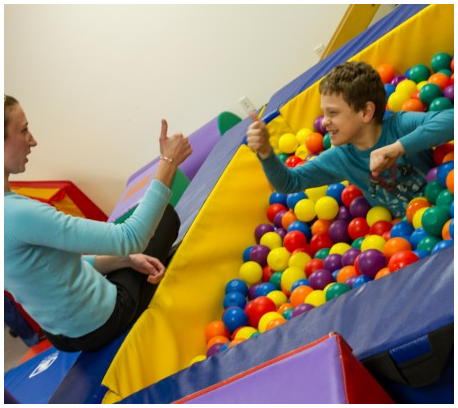 While many parents think of therapy as something that shows limitations, focusing on your child’s strengths and the strengths they are gaining with each therapy session is essential for each child’s improvement and confidence. As a family, find ways to celebrate the victories, just as you do after their sports games, dance recitals, or band concerts. Whether your child needs occupational, physical, or speech therapy, make their experience a positive one! ← How Does Occupational Therapy Improve Daily Activities For Children?